Did the invention of photography kill the painted portrait? Of course not. 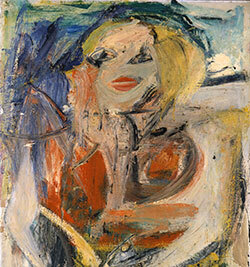 Willem de Kooning made a portrait of Marilyn Monroe in 1954. The painting consists of a few splotches of yellow and blue paint. There are two sketchy and lopsided eyes in the middle of the canvas. Two wedges of red surely represent Marilyn’s lips. Is that an arm on the right? Maybe. There’s a human form in there somewhere. But this isn’t a portrait in any way that the Great Masters of European painting would have understood. “Face Value: Portraiture in the Age of Abstraction” Through January 11, 2015. National Portrait Gallery, Washington D.C.
You can see de Kooning’s painting today at an exhibit in Washington D.C. at the National Portrait Gallery, part of the Smithsonian Institution. The exhibit is called “Face Value: Portraiture in the Age of Abstraction.” The point of the exhibit is to display the work of “mid-twentieth century artists who were reinventing portraiture at a moment when almost everyone agreed that figuration was dead as a progressive art form.” Thus, de Kooning’s offering. He was trying to salvage some aspect of the human figure at a time when realistic looking paintings were not at all in fashion and portrait painting had been relegated to Sears. It hadn’t always been this way. For hundreds of years, a painted portrait was supposed to look like the person it portrayed. Even especially talented and artful portrait painters — like Hans Holbein the Younger (c. 1497-1543) — had to think of portraits primarily in terms of a good likeness. Holbein’s portrait of Christina of Denmark (1537) is, for instance, an especially beautiful painting. Her hands are the best part. That’s because of the way she grasps a glove between her two hands, the index and middle finger of the left hand intersecting gently with the fingers of the right. Christina’s face is impassive, hard to read. Her hands, though, reveal a tremendous vulnerability. When you look at those hands, you are forced to like Christina of Denmark. But the painting was not meant to be primarily a work of art. It had a more practical purpose. Holbein the Younger was, for a time, court painter to Henry VIII. He was sent to Brussels by Henry VIII expressly to make a portrait of Christina. Henry was shopping for wives at the time; his third wife, Jane Seymour, had just died. Holbein’s portrait, then, was not art for art’s sake. It was more like art for marriage’s sake. Thus, Holbein had to tread lightly. He would be expected to present Christina in, more or less, her best light. At the same time, he had to be accurate. Holbein didn’t want to give rise to a fantasy that would, upon the presentation of the actual Christina, create disappointment and embarrassment for Henry VIII. When Henry saw the portrait, he was smitten. Henry saw in Holbein’s portrait of Christina exactly what the rest of us see: a young woman (sixteen at the time), beautiful and assertive, thoughtful and self-aware. A person you want to know better. Alas, Christina had no great desire to know Henry as he wished to know her. She’s rumored to have quipped to the English ambassador, “If I had two heads, one should be at the King of England’s disposal.” Henry VIII, you’ll remember, had recently removed the sole head of his second wife, Anne Boleyn. Christina was right to be wary. Henry was not yet cured of his itch to separate the heads and bodies of his wives. Catherine Howard, also painted by Holbein the Younger, was beheaded a few years later. For three centuries after this, the job description of a portrait painter remained roughly the same as it was for Hans Holbein. Artists were expected to use their craft in order to create convincing likenesses of the people they were being paid to portray. These paintings hung in government buildings, palaces, and private residences. Then, in the early 19th century, something earthshattering happened in the world of portrait painting: Photography was invented. Portrait painting was reduced, rather quickly, from being an essential and lucrative trade to being a specialty act. After the advent of the camera, people had their portrait painted only because they liked, and could afford, the “artiness” of it. If you wanted a perfect likeness, you had your picture taken. It would be difficult to overstate the impact of photography on the art and craft of painting. The ease and accuracy by which the camera could record visual images caused an existential crisis for painters. Why paint anything when you could take a photograph? For plenty of painters — especially those in the business of painting portraits — the writing was on the wall. They traded their brushes for cameras, had new business cards made, and declared themselves professional photographers. But those who continued to paint had to find something within painting that justified its existence. Painting couldn’t just be a matter of visual likenesses, since photography did that faster, better and more cheaply. Painting had to express something about the visual world that went beyond recording how it looks. The history of painting from Impressionism to post-Impressionism to Abstraction is largely a story of the ongoing attempt to make sense of painting in a post-likeness environment. The Impressionists, for instance, thought they could show us how we see, rather than what we see. The Post-Impressionists thought they could show us the unseen at the border of what we see. The Abstractionists thought they could show us the underlying forms upon which the visual world depends. By the time the Abstract Expressionists came around in the 1940s and 50s, the idea that painting should create visual likenesses of living human beings was an idea dead, buried, and long forgotten. To do portraiture as Hans Holbein did in the 16th century, in 1950s New York City, would have been like wearing one of those fluffy Elizabethan collars to work on Wall Street. You’d only do it to cause a sensation. That’s the way the artist Chuck Close remembers it. Thinking back to those days, he said, “The dumbest, most moribund, out-of-date, and shopworn of possible things you could do was to make a portrait.” So that is exactly what he did. And Close did not just make portraits — he made portraits by meticulously and mechanically reproducing photographs with paint on canvas. The style came to be known as Photorealism. You can see an example of one of Chuck Close’s early Photorealist portraits at the “Face Value” exhibit in D.C. It’s called Nancy. Close’s portrait looks like a big, blown-up, black-and-white photograph of a woman’s head. Many of the people who first saw this painting didn’t get it. Okay, they said, it’s a painting that looks more or less just like a photograph. What’s the point? This is a fair question. You can begin to answer it this way. Even in the mid 20th century, painting was still reeling from the crisis brought on by photography. The path from Impressionism to Abstraction provided some answers, some direction forward. But plenty of painters felt constricted by the idea that painting had to be abstract. 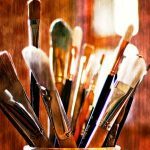 Was painting thereby forced to abandon the everyday world forever? Would painters ever be allowed to paint people again, or trees, or rivers, or flowers in a vase? Photorealists said yes. They decided that it was time to reclaim “the real world” for painting. But photography had long ago established its primacy as the recorder of how the real world looks. Want to have an accurate memory of your wedding day? Hire a photographer. Photorealists came up with a clever way to bring painting back into this story. They started making painstakingly accurate paintings of photographs. By painting photographs, they’d found a “back door” route into the world of people and trees and flower vases. Admittedly, this was not a long-term solution to the dilemma of painting after photography. But no aesthetic answer has ever been long-term. It worked for the moment. The Photorealist experiments of artists like Chuck Close were a revelation to many painters laboring in the shadow of Abstract Expressionism. The demon of photography was being exorcized by facing it head on. And the Photorealists were helping us all to see something else through their work. They were helping us to see that, in the more than a hundred years since the invention of photography, the photographic image had come to dominate our sense of perception. Photographs had become the “picture” of what reality really looks like. If you wanted to know the truth, you looked to a photograph — which, as the saying goes, never lies. Visual truth-telling had previously been the domain of painting. You can see this in looking at early photographs. Photographs from the mid 19th century often have the look and feel of paintings. This makes perfect sense if you think about it. People in the 19th century were used to looking at painted scenes. Early photography therefore had to fulfill the expectations of eyes trained by seeing painted pictures. Over time, this began to change. The eye of the general public became more and more attuned to the way a photograph looks versus a painting. By the 1950s, an average adult would have looked at tens of thousands of photographic images. Maybe more. 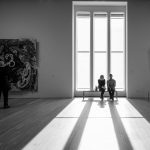 How many images does a person look at in a single day? Think about advertisements in shop windows and on billboards, in newspapers and in magazines. Modern life is a flood of photographic images. Chuck Close and other Photorealists were, by painting photographs, showing us that photographic images had become, in many cases, our primary access to the real world. An event didn’t really happen, a person didn’t really exist, unless there was a photograph to prove it. Painting photographs was a way of becoming aware of how dependent on photographic images we’d become. It was also a way to fight back against the idea that photography should get the last word. By making a painting of a photograph, the painting becomes the last word. Once the demon of photography was finally exorcised, painters allowed themselves to paint everyday visual reality again. Still, the core questions, the hardest questions, remain. 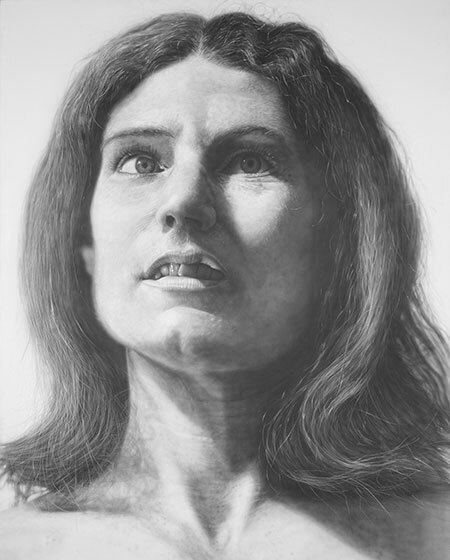 Look again at Chuck Close’s Photorealist portrait Nancy. Is there something about the painting as a painting that makes it special? Does it show us something that a photograph of the same enormous size would not? Is there something important about the process of painting itself or the physical substance of paint?